​​​​​​​​Easy and safe dispensing of flammable liquids. 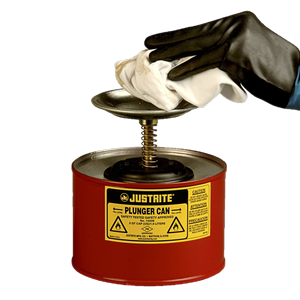 Justrite® Plunger Safety Cans for flammable liquids are ideal to easily and quickly moisten cleaning cloths or rags with a measured amount of liquid without being exposed to the harmful vapours. Pushing down on the pump assembly fills upper pan with liquid. 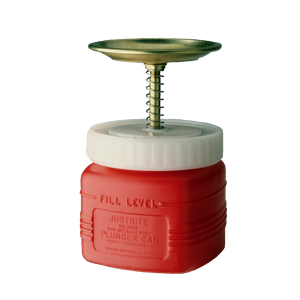 Surplus liquid drains automatically and safely back into the reservoir of the safety can. The volume of the plunger can is therefore used in an optimal way. With the help of the pump base, made of chemically resistant brass and Ryton®, the liquid has to be refilled only when the safety can is completely empty. 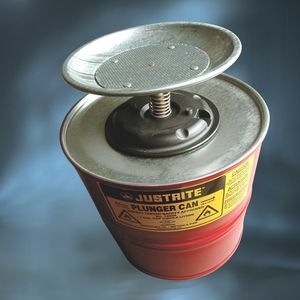 ​​A flame arrester integrated into the pan protects against ignition caused by external factors. 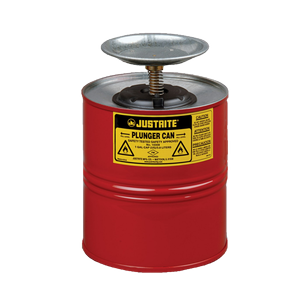 It prevents the ingress of ignition sources without reducing the liquid flow in the plunger can or from the plunger can.